Danny Fields knows a lot of people. Since entering the music business through writing reviews and promotional copy (way back in 1966), one way or the other, Mr. Fields has been involved in the music of the Doors, Lou Reed, Nico, Judy Collins, as well as managing the Stooges, the MC5 and most famously, the Ramones. The new documentary by Brendan Toller, Danny Says follows Fields from his Harvard days (where he dropped out of their law school) to hanging at the infamous Warhol “Silver Factory,” to being Director of Publicity at Elektra Records, to further and beyond. What is apparent here is how wonderful those days were, when rock was coming into its own and how many truly original artists there were. The business had not yet become a ‘business’ really, there was tons of money to be made and plenty of uncharted cultural taboos to tickle. Fields discusses as much about being a gay man back in those times, as he does the music and culture and his honesty comes through loud and clear with his comic turns of phrasing and insight. We also get interviews with such notables in the rock world including Alice Cooper, Iggy Pop, Tommy Ramone, and Judy Collins, to name but a few. Amassed from over 250 hours of present-day interviews and items from Danny Fields’ immense archive (thousands of photographs, audio cassettes, ephemera). Danny Says is wonderful stuff. 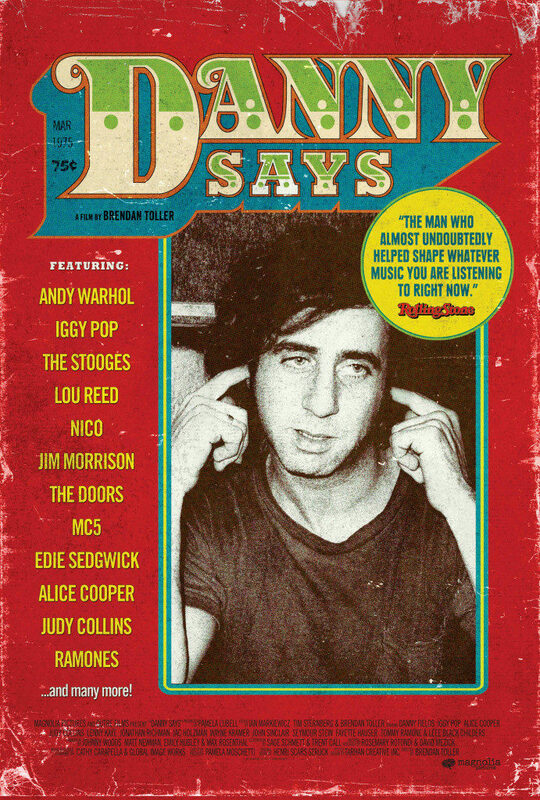 Danny Says is now in select theaters nationwide and available On Demand, on iTunes and Amazon Video.